Yesterday's cake was in my mind for some time, the components aren't difficult, the only thing I had to decide was whether I would make a "bombe" or build it in a spring form. In the bowl of your mixer, combine eggs and water and whisk on high speed for 1 minute. Add sugars and whisk for another 3 minutes. Mix dry ingredients and sift half of it into the egg creme. Whisk on low until incorporated, add the second half and incorporate. Don't mix too long. Pour 3/4 of this batter on a sheet pan lined with parchment paper, spread to corners. 1/4 of the dough goes into a 22 cm springform pan (bottom lined with paper). Bake for 10-15 minutes on 200C (sheet) and 15-20 minutes (springform). Straight from the oven, turn the sheet cake upside down onto a towel generously sprinkled with powdered sugar. Carefully remove paper. While still warm, spread with jelly and carefully roll cake from long end. Cool on wire rack at least 30 minutes. (I used a slightly damp towel to keep it from unrolling. When cooled, slice into approx. 16 1" slices. Remove bottom layer from spring form and set aside to cool on a wire rack. Mix powder with gelatine, set aside to soften. In a medium saucepan mix egg yolks, sugar, juice and wine and heat on low/medium, whisking continuously until it starts to thicken, then add the gelatine mixture. Pay attention, due to the lemon juice this comes together very, very quickly! Set aside to cool. Whip cream to medium peaks and fold in yoghurt. Fold this mixture into the cooled gelatine cream. Use right away, don't let it set too much. -if you don't have access to this cake glaze you could use the recipe for the mirror- as well. Now this is one to pay attention to, I really thought it over but the best way to do it is build it top side down, that way you´ll ensure the top layer is straight and level. 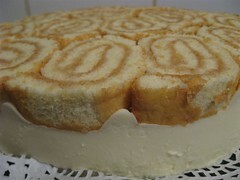 In short hand: jelly roll slices go in first, bavaroise is next, top with cake layer, cool and unmold. Finish with mirror and decorate. 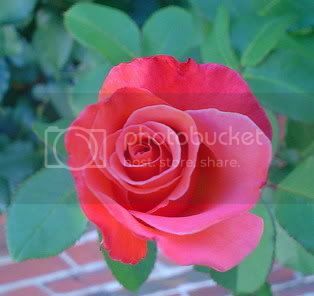 ~ Prepare a larger spring form (26cm), oil the sides with a vegetable oil, line the base with waxed paper. 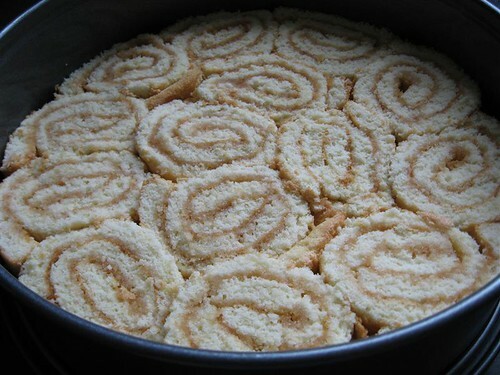 ~ Arrange the jelly roll slices on the base, starting on the rim, working your way to the center. Make sure the slices are firmly pressed together, don´t leave any gaps. ~ Pour the bavaroise in (save about a cup of bavaroise for piping a rim around the cake layer), wiggle a bit to get rid of air holes and ensure an even smooth layer. ~ Arrange your base cake layer on top of the bavaroise, lightly press down, leaving a rim. ~ Pipe a ring of bavaroise around the cake layer. Smooth with the back of a teaspoon. 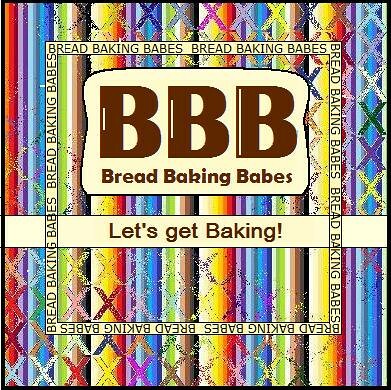 ~ Refrigerate and let cool and firm up for about two hours or more. You won´t be able to move this cake around once it´s turned so use your serving platter, place it on top and turn upside down. Open ring, carefully slide it off, remove springform base. Now, place the ring around the cake again, ever so careful, snap it close and pour the thickened (syrupy not jellied) finish over the top of the cake. Refrigerate again to let it set. Verdict and Filling: I used the wine-yoghurt recipe for the filling, but frankly I thought it was a bit disappointing (I might have picked the wrong wine, and perhaps should have used a dessert wine instead) and I think a minority of the taste/panel agreed. I didn´t like the slight bitter (not tart) flavour and would prefer a tart yoghurt bavaroise, or the bavarian we used in the Strawberry Mirror Cake, recipe can be found here. Mix yoghurt, juice, sugar. Soften gelatine sheets in cold water for 5 minutes, squeeze to get rid of excess water and dissolve in 4 tbs of hot water. Whisk gelatine mixture and yoghurt mixture. Whip cream to soft peaks and fold into yoghurt/gelatine mixture. Use as directed in the recipe. Question: would you like to read this recipe in Dutch as well? Let me know please! I've looked at this jelly roll cake somewhere in a book and been awed and then you do it! Love all these beautiful little jelly rolls! so this is how the cake was made. Very nice! Can I have a slice please? Tanna, the cake was yummy indeed, I scooped half the white off and enjoyed the rest! Nooo, Joanna, you wouldn't... would you? I was so happy I could post these crappy pics I just went ahead with it without the Dutch. Veron, sure, my thighs are very generous; all calories I can give to someone else are happily send off! This is stunning. My wheels are turning, and I wonder if instead of a cream at all you could do a brownie layer, or maybe an icecream layer. I just love the swirls on the top. Brava! WOW, just WOW! Your cake is amazing. The cake looks so tempting. Thank you for sharing the recipe and the "verdict." I think I may use rum (or some other liquor) instead of wine.